Let me tell you a little story, of a couple of new home owners. My husband and I went on vacation. We turned our thermostat off, in the middle of winter, because we were not going to be around. My sister (who luckily had a key) brought our mail inside one day, and found our house at roughly 40 degrees. She called me and told me that we needed to keep it on a LITTLE bit so that all of our pipes didn’t freeze. I had no clue! So many things can happen to your house when you are away, and having someone watching out for you (like my sister) is so important! 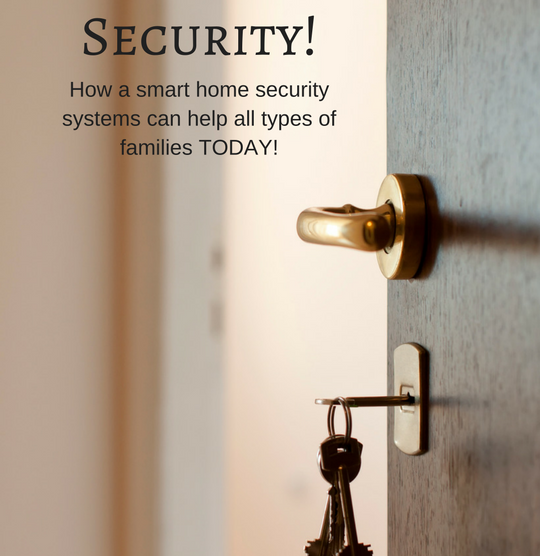 These days families are concerned about security, AND everyone is looking into options on how to make their home “smarter”. Now, you can kill two birds with one stone, and get everything set up and managed for you, so you don’t have to think about it! I had the opportunity to speak with someone at Alarm.com recently about what they are doing to help families of today! The future most definitely looks bright for all kinds of different families. One of the main complaints I receive about smart home systems is that they are so disjointed. There isn’t ONE app that will allow you to control all the features you want to control. Another complaint I receive is that it’s really complicated to set up, and even more complicated to make it work. That’s the same complaint I hear about regular home security systems. I’ve heard of so many people that choose to keep their security systems off most of the time because of alarms going off when they don’t want them to. The great news is that alarm.com is now making it super easy to accomplish both smart home systems, AND home security. First up we have the situation where both parents work outside the home. 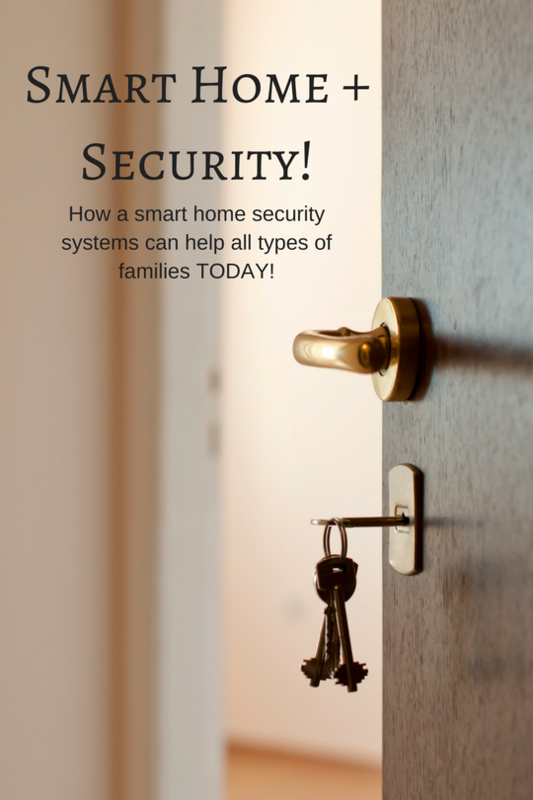 You may think that this is going to be the family set up that would need smart home security the most. My main question for alarm.com was what kinds of things can be controlled remotely with a managed system like this. The great news here is that there is ONE APP to rule them all, and it can all be done remotely. You can check your video cameras inside and outside of the house, get a doorbell alert when someone comes over, you can control your lighting, thermostat, door locks, garage door, and even arm or disarm your alarm at the push of a button on your smart phone. I mentioned that you can get an alert for when the doorbell rings, BUT you can also act like you are home by speaking with the person at your house through the doorbell. Say, an important package arrives at the house. When you are alerted that the delivery driver is there, you can unlock your side door, and ask them to leave it inside! Once you see that they have left, you can lock the door back up again! With alarm.com they work with local providers for installation and ongoing maintenance and management of your system. Because of this, you will likely be able to find an installation window that can work with your schedule, since most working families aren’t typically around their house during the week. You won’t have to take a day off of work just to get your system installed. The other benefit to this, as opposed to something you piece together yourself through purchases at the store, is that when one part of your system isn’t working, they will come out to fix it! What about families with one parent who stays home? Can they benefit from a managed smart home security system too? I was very curious as to the benefits for these families, since they wouldn’t need a lot of the remote lock features and other remote management. They also would likely not arm the system very often, as someone is typically always at home. Although, I don’t know a single stay at home parent that actually spends most of the day at home…. I guess it happens. One thing the alarm.com rep mentioned to me was the fact that you can put one of the video cameras in the nursery to monitor the baby when they are sleeping, waking up, crying, pooping, as they are likely to do from time to time. Instead of purchasing an expensive specific baby monitor, that will be useless as the children grow, you can either move the camera to a different part of the house (or keep it there for when they are a teenager!) Speaking of sleeping babies though, the doorbell has a feature where you can turn it on silent mode. The doorbell won’t ring inside the house, and it will notify your phone when someone is at the door. This keeps the neighborhood kids from waking up your baby at extremely inopportune times. I was also concerned, as a stay at home parent, about people trying to break in. I know the alarm will sound if they try to bust through a window, but what about someone who comes to the door, looking innocent enough, and then tries to force their way into the house. This situation would have no alarm and would not notify emergency personnel right away. They informed me that there is a key FOB that can go with your system. If I bring that FOB to the door when I go to answer it, I can press the panic button on the key FOB and alert emergency services right away. I was extremely happy to hear this solution! 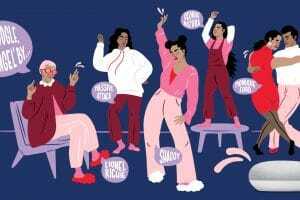 What stay at home parent doesn’t run about a bazillion errands throughout the course of a week? What I REALLY liked about this system is the geofencing. What that means is that you create a border around your house within the app. Once you leave that area, you will be notified about any doors not locked, you can change lights and the thermostat on the fly to save energy, and you can arm your system if you forgot to before you left. I mean, I am ALWAYS remembering every single thing when I leave the house, right?? Also, as you run your errands, and you start running a bit late for when your kids come home from school, you can relax knowing they will still be able to access the house, and you will be notified when they arrive, just like our working parent friends! The last scenario I wanted to run past my friend at alarm.com was the traveling family, and oh boy are there some great solutions for you folks! On top of EVERYTHING mentioned above, there are some great automated features you can use to make it look like you are around when you are not. We all remember the movie Home Alone, right? Where the burglars knew exactly what time all the houses would have their lights turn on? It’s awesome that we live in the future, because we don’t have to rely on just timers anymore. Your smart home security system can check to see what time sunrise and sunset is, and then it can randomize when the lights will turn on/off depending on that! You can also schedule your blinds to go up and down, and randomize that as well! Traveling families need to give various people access to their home as well. Someone who gets the mail, feeds the pets, waters the plants, etc. In the app you can grant special codes for different people. This way, you know if they are actually coming around AND if you need to revoke a code on the fly you can do just that. Circling back to my initial story… granted we purposely turned off the heat in our house, if we had known better, we could have kept an eye on the internal temperature of our house while we were away, and known that it was getting entirely too cold inside. If we HAD kept the heat on though, and we got alerted that it was getting cold, we would also know that something wasn’t working right inside the house. We could call a repair-man, give him a code to get inside the house, and have it fixed before we even started our way back home! No one wants to come home from vacation to a freezing cold house! This smart home security system works with many devices you might already own, so it’s totally worth it to give them a call to see how much more it might cost to have the whole thing managed for you. Definitely go check out what they have to offer, and you might just find yourself a lot more secure very soon!